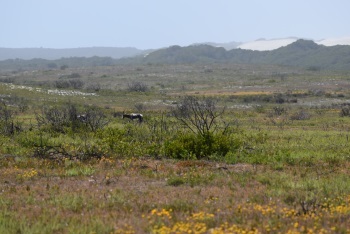 The Cape Floral Region Protected Areas consists of 13 clusters covered with fynbos and known for their rich plant life. They are located in the Mediterranean climate region of South Africa Western Cape Province and the Eastern Cape Province. The Cape Floral Region is one of the few WHS solely focused on flora. ‘Fynbos’ is the key subject here: a diverse shrubland and heathland vegetation with many endemic species. It comes for example in the variation of ‘rooibos’, that is used for the eponymous tea. Although plants aren’t my specific area of interest, I managed to visit Kirstenbosch Botanic Gardens and the Table Mountain National Park during my 4 days in Cape Town. These cover only 1 of the 13 inscribed clusters – the other 12 are located in the Western and Eastern Cape Provinces. My explorations started at Kirstenbosch gardens. I was staying at a Bed&Breakfast in Klaassens Road, next to Gate no. 3 of the gardens. This whole area is incredibly lush – and wealthy. Properties sell easily for over 1 million EUR. Entering Kirstenbosch via this upper gate leads you directly to the fynbos and the proteas, both almost only to be found in the Cape Floral Region. With the Table Mountain directly in the background, it’s all very pleasing to the eye. The lower part, near main entrance no. 1, is a bit more like a landscape garden and hosted lots of picnickers when I was visiting on a Saturday afternoon. We’ve discussed before on this website whether it is more important to preserve an iconic and large fauna species such as the giant panda or the mountain gorilla, than for example a mouse or even an ant. This also applies to the flora: we have the giant trees of Redwood and the double ‘coco de mer’ coconut of Vallée de Mai. The Cape Flora Region’s main claim to fame is its fynbos – which essentially is a low and unassuming shrub. I have tried and tried to find anything to love about it, but I can’t. I spent 3 hours in Kirstenbosch, which is a pleasure to walk in. Kirstenbosch also has a (rather lame) canopy walkway, a new addition to our connection. More extreme activities can be done from Table Mountain. Getting there involves stepping into a spectacular cable car that rotates 360 degrees during the ride. From the top you can try abseiling, or just watch other people do it. The remarkable thing about the top surface of the Table Mountain is that it is covered by a great variety of plants. Somehow you would just expect a rocky platform. There are trails to explore the 3km width of the mountain, and it is recommended to go as far from the cable car station as you can – only there you will find some peace and quiet to enjoy the landscape. Yes, Table Mountain is one of our ‘one million visitors or more’ sites. Kirstenbosch and Table Mountain are two of the obligatory stops on any trip to Cape Town, and they were well worth a visit. They attract lots of people, both locals and tourists: a bit too many for my taste. The diversity in plant life is easy to grasp and certainly a strong point of these two locations. Unfortunately I was too late in season for the blooming of the flowers, so I had to look at a lot of green shrubs. A large part of the satisfaction I got in ticking this site off stems from the fact that not only did I see the three nature reserves that form the Table Mountain National Park, but, more importantly, I was able to pay proper visits to seven out of the eight protected areas that make up the inscribed serial property (I missed out Groot Winterhoek). The Cape floral region is a truly unique ecosystem of the fynbos. Kirstenbosch provides a bird's eyeview of the different fynbos that thrive across different habitats, and it would be best to start one's travel here (I, however, started with the Baviaanskloof moving towards Table Mountain then going up to the Cederberg, making the botalnical garden my last stop). Here are some of the highlights: (a) the beautiful mountain scenery provided by the Swartberg Pass and the Merringspoort Pass. Both connect the Little Karoo and the Great Karoo, and are great feats of mountain engineering; (b) the rock formations of the Cederberg and its good collection of ancient Bushmen paintings (we took the Sevilla rock art trail); (c) the coastal white sand dunes and game drive of De Hoop; (d) views of Strand, Stellenbosch, Franchshoek and the rest fo the Boland area/wine region on top of the Holland-Hottentots mountains; (d) scenic coastal drives by the Cape of Good Hope and Kogelberg biosphere reserve -- very enjoyable! ; and (e) imposing beauty of Table Mountain as seen in and around Cape Town - a true world-class landmark! Also memorable was the walk along the penguin colony in Simon's Town, which is part of the inscribed property as well. Overall, the outstanding universal values of this serial property is not hard to understand and appreciate. Each protected area is different from one another, and is definitely worth visiting. Visiting Cape Town a collector can visit 2 sites. First is Robben island and second is Cape Floral Region. This site consists of six (?) parts which are geographicaly in whole region of Western Cape. So I visited only the "Kirstenbosch Botanical Garden" and Cape Point National park. The whole region is a housing of Fynbos ("fine bush") which is rare only for this part of world. The natural location is very nice and I enjoyed my stay there, especialy on Cape Point even it is very windy. Just be prepared that you will need a whole day for such a trip. Situated with the spectacular Cape Floral Kingdom, Table Mountain is a famous landmark and icon for all those that live in the Cape. Being from Johannesburg I had never actually been up to the top of Table Mountain and always wanted to. When eventually including Cape Town in our holiday it was decided that a visit to the Cape Floral Kingdom and the top of Table Mountain was a definite. Even though it was rather hot, we knew it would be freezing up on the mountain. After clothing ourselves with at least 3 layers of clothes and packing our picnic basket, we headed our way to the famed Table Mountain. We boarded the Cableway which would transport us up to the top of the mountain. The view was spectacular! The cable car’s rotating floor enabled us to see a 360 degree view of the entire city and floral wonderland below! The scenery was absolutely exquisite. When we arrived at the top of the mountain, I could not wait to see the view. The entire mountain boasts walkways and seating positions from which the city can be admired. On the one side we could see Camps Bay and watch how the sun caused to entire sea to shimmer. On the other side we could appreciate Cape Town’s sheer expanse and could even spot Robben Island! It is so quiet up on the mountain. It is almost as if the world stops when you admire the view up here! Everything else stops and becomes silent. There is a restaurant up on Table Mountain serving lovely hot chocolate to keep you warm. We found a perfect spot on the rocks for our picnic. As we feasted on our goodies and sipped on champagne, we admired the spectacular sunset and the pure radiance of the sky. It was truly exquisite. When the sun retired for the day, it became extremely cold! That’s when we headed off to the restaurant for that warm hot chocolate and cuddled inside! When at night, the city’s myriads of lights illuminate the entire sky! What a breath taking sight. We could truly appreciate Cape Town’s size when admiring the expanse of lights. In fact, we could see lights as far as the eye can see! As I sat there admiring the beauty, little did I know that very soon, in a few months, I would be proposed to here at this very spot! Table Mountain holds many wonderful and unforgettable memories for me. It is an exquisite place I will always return to and admire. No matter how many times you visit Table Mountain, the spectacular view never becomes boring! The WHS additions in July 2004 were a mixed lot in my opinion but 1 stood out for me –the “Cape Floral Region Protected Areas”. Alongside the usual litany of uninspiring/mediocre European sites (Liverpool, Muskauer and Andorra Valley?) and shady political dealings (The Koguryo China/N Korea “compromise”!) here was a site whose selection showed real imagination. A site of genuine uniqueness and justifiable preservation. Yet it took UNESCO from the year 2000 with 2 “deferrals” to get this nomination accepted! So typical of bureaucrats to concentrate on “Dotting the I’s” rather than on the value of the concept! From within this “kingdom” 8 areas have been inscribed stretching as far as 450kms from the city of Capetown. The most famous and easily accessible is that of the Cape Peninsular itself although this is the second smallest - you will go through it if you go down to the Cape of Good Hope (as we did). To quote again “The distinctive flora which contains 80% of its floristic richness is a shrubland known as “Fynbos”. The most famous genera found in this habitat are the Proteaciae. The Protea in its various forms is a magnificent plant often now sold in Europe for flower arrangements having been flown in from S Africa. These, and many other wonderful plants, are easily viewable growing naturally as you drive around the Cape Region. My photo is of a stand in the flower show of a pleasant little town called Clanwilliam near to the Cederberg Wilderness area of the WHS showing a variety of Proteas. August/September is the best time to see the flowers – we took them in as part of a drive down from Namibia via Namaqualand with its own wonderful flowers. As you drive south you “follow” the blooming of the flowers all the way until you finish up at the Cape itself – a wonderful trip! 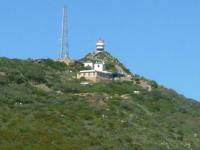 Article, photos and maps of the "Cape Floral Kingdom"
Lighthouses: Cape Point lighthouse, Old and New. The light of the new lighthouse is the most powerful on the South African coast. VOC: Kirstenbosch Botanical Gardens . "Surrounded by manicured lawns and orderly garden beds is a straggling, tangled thicket of shrubs. As botanical specimens they are unremarkable but they are, in fact, the remains of a hedge planned in 1660. Jan van Riebeeck, the commander of the Dutch East India Company, commandeered a group of French shipwreck refugees, who had been en route for Madagascar to plant the hedge. Consisting of wild almond trees and other thorny shrubs it was designed to try to keep the local indigenous people (whose livestock routes had been disrupted by the company's newly established Cape Town settlement) out and stop them from raiding the company's cattle." Sir Francis Drake: In 1580 he described Table Mountain" as "A most stately thing and the fairest cape in the whole circumference of the globe"
Charles Darwin: Darwin stayed June 2-18 1836. Made a 4 day trip east into the interior and crossed the inscribed area of the Boland mountain complex around Franschoek. Comments in his "Beagle Diaries" about Table mountain "... this great mass of horizontally stratified sandstone rises quite close behind the town to a height of 3500 feet; its the upper part forms an absolute wall, which often reaching into the region of the clouds. I should think so high a mountain not forming part of a platform & yet being composed of horizontal strata, must be a rare phenomenon." In his (separate) field notebook he commented on the slate formations on Lions Hill and Lions Rump (both in Cape Peninsular NP) where he climbed to collect specimens :- "He also traced the transition from slate into gneiss at the Lions Rump and decided that the foliation of the gneiss was of metamorphic origin and did not necessarily indicate the original sedimentary layering." Cecil John Rhodes: Includes Kirstenbosch Botanical Garden. "... purchased by Cecil John Rhodes in1895........ 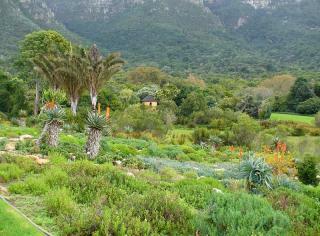 The land now occupied by the Kirstenbosch Gardens was bequeathed to the Nation by Cecil Rhodes who died in 1902." (Wiki). The Nomination File makes several references to the "Rhodes Will" in which he left a large portion of land on the slopes of Table Mountain to the nation. Pliocene: on the basis of unchanged landform since then, period of most speciation and establishment of general climate patterns as of today despite subsequent ups/downs: "While the radiation of Cape clades occurred throughout the late Cenozoic, speciation was most prolific during the Pliocene." Built or owned by Dutch: The whole area, including for example Kirstenbosch National Botanical Garden "In 1660 a hedge of wild almond (Brabejum stellatifolium) and brambles was planted to form the boundary of the (Dutch) colony. Sections of this hedge, known as van Riebeeck's hedge, still exist in Kirstenbosch"
Fatal Accidents or 'disasters': Table Mountain - "... 10 to 20 fatalities on it a year"
Incorrect UNESCO 'Number of locations': No indication of a separate serial ID for the locations that are shown on the (old) map. Extension from 8 to 13 sites in 2015 not acknowledged.